Many Muslims regard Suleiman as an example of the ideal or model ruler. Unfortunately, too many Sultans chose to emulate Selim's example of indolence, rather than Suleiman's good governance. The contrast between father and son, which could not be starker, suggests that a fundamental flaw of dynastic systems is that competency cannot be assured. Only systems that allow people to exercise responsibility based on their merit, skills and competency can ultimately allow societies to thrive. After gaining the throne through palace intrigue and fraternal dispute, Selim II became the first Sultan devoid of active military interest who was willing to abandon power to his ministers, provided he was left free to pursue his orgies and debauchery. Therefore, he became known as Selim the Drunkard or Selim the Sot (Turkish: Sarhoş Selim). His Grand Vizier, Mohammed Sukulli, a Serbian devsirme from what is now Bosnia and Herzegovina, controlled much of state affairs, and two years after Selim's accession succeeded in concluding at Constantinople an honorable treaty (February 17, 1568) with the Habsburg Maximilian II, Holy Roman Emperor (1564–76), whereby the Emperor agreed to pay an annual "present" of 30,000 ducats and essentially granted the Ottomans authority in Moldavia and Walachia. Against Russia Selim was less fortunate, and the first encounter between the Ottoman Empire and her future northern rival indicated dangers to come. A plan had been elaborated at Constantinople to unite the Volga and Don by a canal, and in the summer of 1569 a large force of Janissaries and cavalry were sent to lay siege to Astrakhan then to begin work on the canal. Meanwhile, an Ottoman fleet besieged Azov. However, a sortie of the garrison of Astrakhan drove back the besiegers. A Russian relief army of 15,000 attacked and scattered the laborers who were working on the canal and the Tatar force sent for their protection. Finally, the Ottoman fleet was destroyed by a storm. Early in 1570 the ambassadors of Ivan IV of Russia concluded a treaty which restored friendly relations between the Sultan and the Tsar. Expeditions in the Hejaz and Yemen were more successful, but the conquest of Cyprus in 1571, which provided Selim with his favorite vintage, led to the calamitous naval defeat against Spain and Italian states at Lepanto in the same year, freeing the Mediterranean Sea from corsairs. This was the "main event" in his reign. Cyprus had been controlled by the Republic of Venice since 1489. 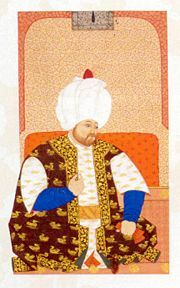 Mohammed Sukulli, Selim's vizier, opposed the war because Venice had a treaty with the Ottomans. Selim issued a royal decree declaring that the treaty could be broken because Cyprus was officially Ottoman territory. Selim fasted for three days after the defeat while Europe rejoiced in the crushing defeat of his navy. Selim's order to kill all Venetians and Spaniards in the Empire was wisely canceled by Sukulli. The Empire's shattered fleets were soon restored (in just six months; it consisted of about 150 galleys and eight galleasses (faster galleys)), enabling the Ottomans to maintain control of the Mediterranean (1573). In August 1574, months before Selim's death, the Ottomans regained control of Tunisia from Spain who had controlled it since 1572. Bernard Lewis comments that in Turkish histories, the battle is known simply by the word meaning "a rout or crushing defeat." Lord Patrick Kinross' account of Selim's reign is part of a chapter called "The Seeds of Decline." He sees the massive outlay for the fleet-rebuilding following the Battle of Lepanto as the start of the Empire's slow decay. Kinross also says that Selim's reputation for drunkenness was solidified in his decision to invade Cyprus rather than supporting the Morisco Revolt in Granada as well as in the manner of his death; Selim died after a period of fever brought on when he drunkenly slipped over on the wet floor of an unfinished bath-house. Schevill says that complete disaster was avoided due to the skills of Selim's vizier, Mohammed Sukulli, whom his father had appointed, "a statesman of rare vision" who enabled the "ship of state for a time to sail on its course with acquired momentum." One reason for the decline in Ottoman fortunes was the fact that the borders established under Suleiman became more or less permanent, as further expansion was curtailed. The whole administrative system, however, was "geared to the needs of an expanding state." The institutions "failed to harmonize with the new and unfamiliar stresses of a border that was becoming static." Inheriting none of his father's skills, Selim was unable to provide the leadership needed to transform the taxation system into one that could sustain civil governance not military expansion. Further expansion did occur, although not at the same rate. The brilliant Soluman was followed by a man who failed to inherit a single one of his father's merits, Selim II ... was incapable, indolent, pleasure-loving, and as foreign to the field and council-chamber as he was at home in the soft atmosphere of the imperial harem." Following Selim II's reign, many Sultan's imitated his example instead of his father's. Instead of concentrating on ruling the vast empire, ensuring that administrators acted justly and governed competently, they concentrated on enjoying a luxurious life-style. After Selim, the empire was ruled by "weaklings" and was "distracted" by "numerous murders of brothers and relatives" and by "repeated seditions." Initially, the Ottomans had used superior military tactics, their army was well equipped with the most recent weapons and well trained. European armies saw the Ottoman army as a model, and copied many practices. Under successive rulers who, like Selim, were disinterested in maintaining the army's superiority, it lost its technological superiority, lagging behind the armies against whom it fought. By the middle of the nineteenth century, reform of the army had become a priority. However, the Empire lacked the financial resources to fund purchasing modern weapons. During the Crimean War, when Turkey was allied with Great Britain against Russia, a large loan was taken out to pay for modernization. This loan was followed by others, until the Empire found itself heavily in debt to the great European powers. By 1881, management of the Empire's "public debt" had been transferred to the European powers. This financial crises can be dated back to Selim's failure to reorganize the Empire's finances. On the one hand, after his father's death, the army needed less money as expansion slowed while the civil administration needed more. On the other hand, over the next several centuries, the way in which the military was funded remained basically unchanged. As the cost of equipment increased, a funding system that had worked well centuries ago could no longer cope with increased costs. By making some treaties and breaking another, Selim II contributed to the notion that Muslims could not be trusted, that they would not honor their treaty obligations. Consequently, fewer European leaders were willing to follow Maximilian II's example by negotiating with the Ottomans. Selim's failure to live up to the high standard of governance set by his father represents an argument against the hereditary system. The problem with any hereditary form of governance is that competency is not necessarily passed on, genetically, from father to son. In empires throughout history, gifted leadership has been followed by corrupt, incompetent or indifferent rulers. Empires that, at their best, brought peace and stability to people's lives, usually decline when good governance failed to be perpetuated. Empires may serve a purpose in knitting more people together in awareness of their common humanity, often building cultures and civilizations with shared values at their center. However, they inevitably disintegrate due to a failure in governance. This suggests that while they play an important role in human development, laying a foundation for the birth of a truly global, interconnected and inter-dependent world community, hereditary rule needs to give way to merit-based systems. ↑ A Christian taken as tribute or instead of taxation into the Sultan's household, a form of slavery. ↑ Parry, Vernon J. and M.A. Cookpage, History Ottoman Empire to 1730 (Cambridge, UK: Cambridge University Press, 1976, ISBN 9780521099912), 108. The Venetians paid tribute to the Ottomans for Cyprus. Selim demanded that Venice yield the island to full Ottoman control. ↑ Bernard Lewis, What went wrong? Western impact and Middle Eastern response (Oxford, UK: Oxford University Press, 2002, ISBN 9780585427652), 11. ↑ Granada, the last Muslim Emirate in Spain, fell to the Reconquista in 1492. In 1568, the small underground Muslim population rebelled. ↑ 6.0 6.1 6.2 6.3 Ferdinand Schevill, The History of the Balkan Peninsula: From the Earliest Times to the Present Day (New York, NY: Harcourt, Brace and Company, 1922), 244. ↑ Carl Von Rotteck, General history of the world from the earliest times until the year 1831 London, UK: Longman, Brown, Green, and Longmans, 1842), 126. ↑ System that select or elect people for responsibility based on their merit, skills and competencies. This page was last modified on 4 September 2015, at 16:23.